As part of the molecular gastronomy seminar in Copenhagen a group of food science students and aspiring chefs who meet regularily in Gastronomisk legestue (= gastronomic playroom) gave a short presentation of their work. 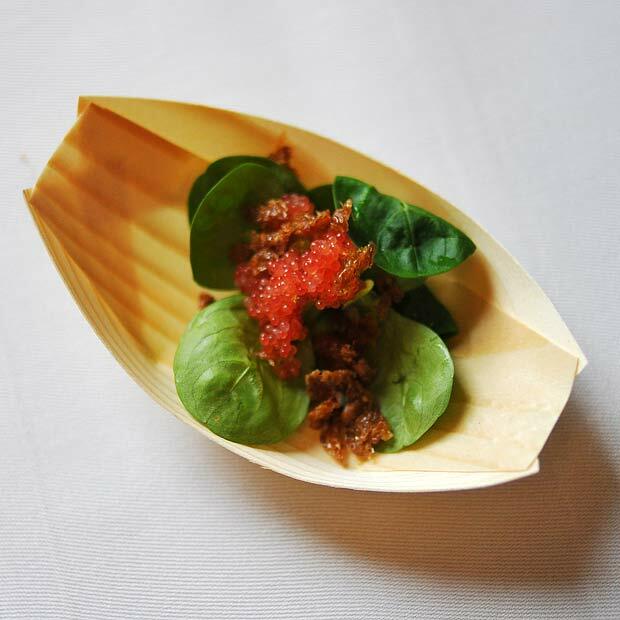 With a yearly budget of â‚¬660 and no scientific or commercial obligations the goal is to let science and craft meet in order to foster culinary creativity. There are many notable chef-scientist collaborations in the realms of molecular gastronomy and modernist cuisine, but this is the first time I’ve heard about an initiative that establishes a dialogue between scientists and chefs while they are still students. Molecular gastronomy will always be an interdisciplinary field and what better way to encourage such a collaboration than in a “playroom”? The students are allowed to use course labs at Copenhagen University, and in return they are asked to do a least one event each year – in 2010 they contributed to Kulturnatten (= Culture night). I admire the initiative and I encouraged Mathias Skovmand-Larsen, one of the founders, to start blogging so the rest of the world can take part in their experiments. Their presentation included 4 samples for the audience to taste. My favorite was the coffee with hot and freezing milk topped with freeze dried coffee. 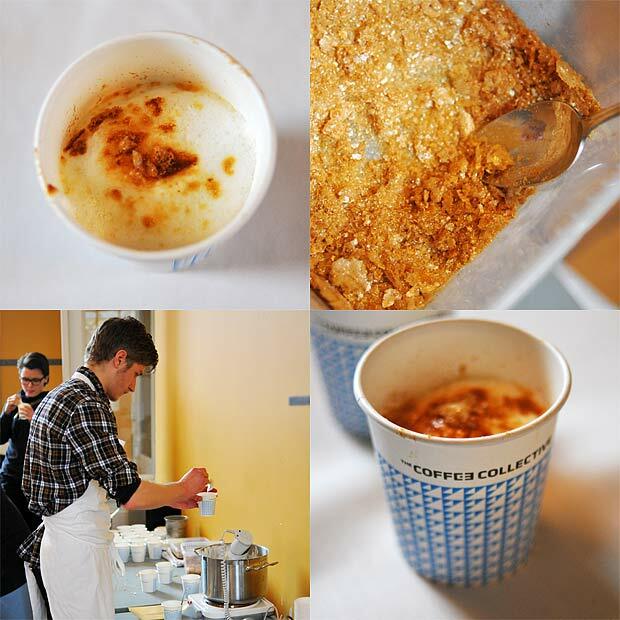 And this was not any freeze dried coffee – it was very good coffee from the Coffee Collective in Copenhagen prepared with an Aeropress and then freeze dried! The freezing milk was in the form of ice cream. Very delicious! 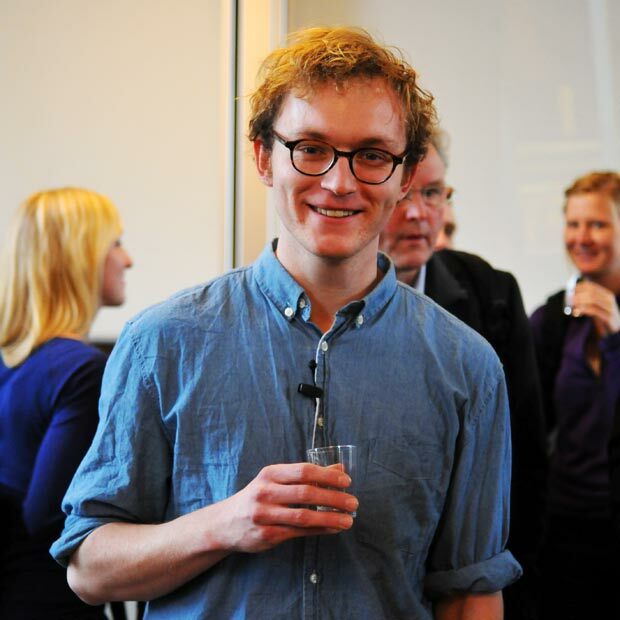 Mathias Skovmand-Larsen holding a glass of sample #1: Birchwood sap and distilled amber. Interesting taste, but only as a base for something more. Sample #3: Chicken under pressure and horseradish. The chicken had been treated (and sterilized) at 6000 bar. 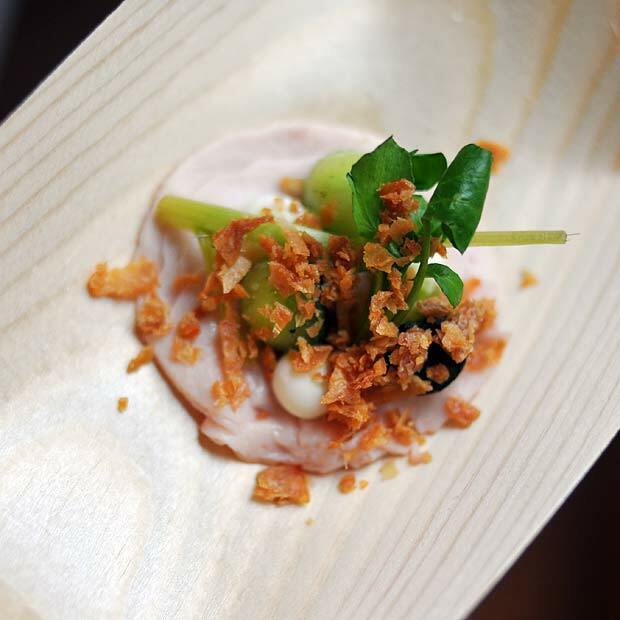 Compared with the pressure treated seafood at The Flemish Primitives in 2010 which retained a very raw character the appearance and texture of the chicken was more like cooked chicken. Sample #2: Lumbsucker eggs and crispy full grain bread, designed for maximum texture contrast. i’d love to see a photo of the coffee creation! ah yes, I can’t believe i missed that. thank you. Seems like a very good idea. I guess this might make things much more realistic and motivating for both student groups. I’ve heard about a similar collaboration here in Norway between nurse students and food&health (home economics) students at university college level focussing on nutrition. Nurse students are preoccupied with health and obesity, whereas food&health students are interested in dietary matters. In Finland a PhD student is doing a similar study of collaboration between chemistry- and home economics teachers (in-service that is, not students).